The Shaping Our Future Continuing Education Series launched in 2018 to help officials and planning staff explore strategies to plan proactively for future growth. The 10-county Upstate region is growing. By 2040, our region’s population is projected to reach nearly 1,750,000 – an increase of 64% since 1990. How and where we grow will have real impacts on our quality of life – affecting commute times and transportation choices, air and water quality and our pocket books. 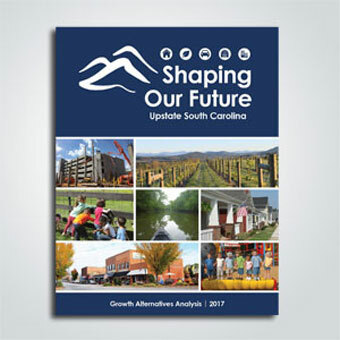 The Upstate Growth Alternatives Analysis used scenario planning tools — specifically CommunityViz software — to measure and evaluate the impacts of our current trend growth trajectory as well as three hypothetical alternatives. The study’s findings provide a valuable resource demonstrating the wide-ranging impacts of varying growth futures and recommendations for how local communities can work to achieve their visions for future growth. The analysis was advanced by the Shaping Our Future Consortium — a partnership of Upstate Forever, Ten at the Top, and the Riley Institute at Furman University — and relied on the guidance of a broad-based steering committee representing the business sector, local governments and utilities, and community organizations; a technical advisory committee; several focus groups; and community feedback. The study built on previous projects carried out by Upstate Forever and other partnering organizations including the Upstate Growth Study, Upstate Reality Check and Upstate Shared Growth Vision and lessons learned during the 2015 Shaping Our Future Speaker Series. The general study area for the growth alternatives analysis is the ten-county Upstate region of South Carolina. The Upstate is home to more than 1.4 million residents and is projected for an additional 300,000+ residents in the next 25 years. Two technical reports were produced during the process to inform the final report: the Return-on-Investment Study and the Cost of Government Services Study. This effort was made possible by the generous contributions of Hollingsworth Funds, Greater Greenville Association of Realtors, Ten at the Top, the Riley Institute at Furman University, New Belgium Brewing Company, Piedmont Natural Gas/Duke Energy and Upstate Forever.